KEF KHT3005 HD2 review | What Hi-Fi? 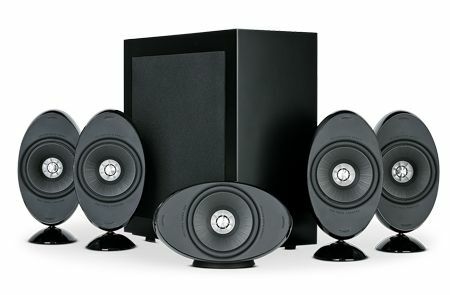 KEF has always been attentive to its trend-setting 3005 package (or 'the eggs', as they're often known) and in this HD2 variation it manages to force the price down below four figures. Compared with the five-star KHT3005SE (costing £1000), the HD2 ditches the dedicated centre channel in favour of a fifth identical satellite speaker. The benefits of a tonal match are obvious, although the HD2 package sacrifices a little of the centre-channel 'clarity and directness' we noted in our 3005SE review. There's also a change of subwoofer; the HD2 is supplied with the T2 sub, a closed-box design with a similarly commendable level of finish as the satellites and a small footprint. It's packing 250W of Class-D amplification and a 25cm forward-facing driver in a box just 38 x 37 x 18cm. In broad terms, the 3005 HD2 is as refined, spacious and smoothly expansive a listen as every previous 3005 variant we've tested. Relaying the DTS HD-Master Audio soundtrack to O Brother, Where Art Thou? the package impresses first with the sheer scale of the soundstage it describes, with effects steering and placement a close second. There's admirable authority and confidence to the way the HD2 manoeuvres through even the most testing scenes, and it offers detail and weight in equal measure. Compared to the current class leader, there's a shortage of outright attack. It's a trait that's quite easily spun as refinement, but the Award-winning Q Acoustics Q7000 package offers more excitement and drive, leaving these KEFs sounding slightly flat. That said, we've no doubt some will happily sacrifice that last sliver of drive in favour of the KEFs' seamless soundfield, impeccable build quality and sophisticated overall approach – and that would be fair, so you should consider these worthy of a place on your audition list.